The enormous quantity of road salts that sprinkled on roads annually, very sadly results in huge damages to car bodies and rims. The salt (chloride) components of the road salt will significantly accelerate corrosion of the metal there were there even the tiniest damages to the paint and/or lacquer. Road salts sadly don’t only attach well to roads but also to the body of the car. Especially the bottom and the space around the wheel collect the rest of a corrosive mix of water and salt. Quite often, in daily use paint and lacquers are already slightly damaged use in those places and become even more sensitive to corrosion. The mix of water and salt gets in direct contact with the unprotected metal. This circumstance will lead to significant corrosion and damage to the metal of your car body. But also for rubber and plastic parts, the mix of water and salt is damaging. And don’t forget that especially alloy rims get easily damaged by the corrosion effects of road salts. It is very important to remove old salt rests from the body of the car during winter. Total damage because of road salts to cars easily ends up in hundreds of millions of euros! 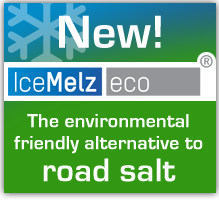 That’s why: if you can, use as much as possible IceMelz eco during the winter to avoid damage to your precious car!